To overcome the issues related to the QuickBooks, many companies are trying to provide those software which can handle all the financial and operational requirements of the organizations. It is important to mention that these efforts have been initiated after studying the actual reviews of the people who want to replace it and are finding alternatives as well. 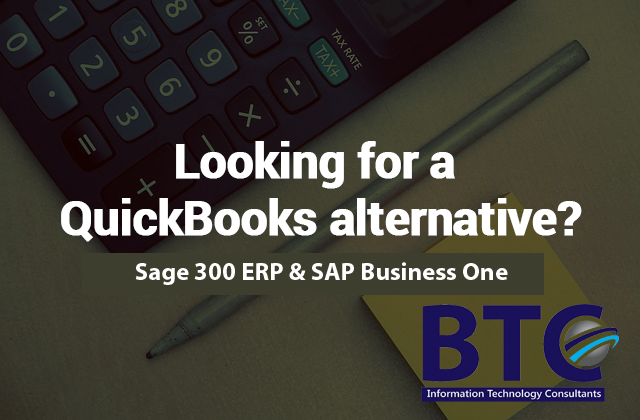 If you are interested in it, we want to mention those popular programs which are the replacements of QuickBooks in which Sage 300 UAE, Intacct and Dynamics GP are included. When we talk about the performances of all these programs, we can confirm that these programs can be better alternatives. As the companies have to perform a lot to manage the product profiles, project costings, accounting transactions and many other operations to run the organization, so to perform all these duties, we need to give you a summary of all that. The product options insist you take the initiative of replacing QuickBooks. Buyers seek replacement is also needed so the replacement of existing software is required. Product profiles cannot be managed in QuickBooks. The requirement of new software according to industry is also important. Now the question is which software is available in the market to overcome the deficiencies in QuickBooks, we are giving you the details of all these programs and percentage of people who are using the particular software for running the operations of the organization. It is very important to mention that this software vary in the features as some are more expensive than others, some have the deployment limitations and some are not suitable for the specific industry. Most customization in reporting is required. The company wants to secure the access control for the financial services and operational activities. The limit of the data has been exceeded beyond the boundary. The company wants to improve the performance of the software when multiple users are accessing the system. The company is demanding the software, which can grow with the organization. The specifically designed software is needed according to the industry requirement. Comprehensive functionality is required to manage the company and estimate the future business and budget requirement. The flexibility is required to manage the workflow of the organization. To sum it up, we want to mention that only those companies think about the replacement of the QuickBooks, which have a need to outgrow the business as they have the requirement of it. The reality is that QuickBooks is a wonderful product and the most productive tool for all types of small and medium enterprises. This tool can perform maximum for these organizations in managing the business operations and financial services. The focus of the developers of the QuickBooks is on the small or medium organizations as they know that there are 23 million companies in the US which are considered non-employer firms while 3 million companies are those which have less than five employees. Due to the focus of QuickBooks on smaller organizations, we can say that they have the excellent strategy in running the application successfully. Although, there are different options for the businesses through which they can achieve their required results and for that, they try Xero, FreshBooks, Sage 50 and Wave, etc. as these are the most relevant choices for the people who are going to replace QuickBooks. But the most popular and enthusiastic software which is the real alternative is Sage 300 ERP. The quality of this program is that it has a long history through which it has influenced numerous organizations. The first program introduced in the market in 1976 and since then, people are referring it to their friends, business partners and corporate organizations. This system has the ability that it can control inventory, purchasing, business management, payroll department, accounting services, human resource, purchasing, and Customer Relationship Management (CRM) and billing department. SAP is another tool which has helped the businesses in managing businesses since 1996. Its recent product named SAP Business One is one of the most popular business management software. This system is based on ERP solution and specially targets the SMB market. The operations, customer relationship management, distribution department and financial management are the key features of this product. SAP Business One helps the departments like supply chain management, production planning management and warehouse management and due to this, has gained the popularity among the businesses like manufacturing and distribution. Some software are much more simple minded and offer only a fraction of the features found in QuickBooks. But regardless of how feature-rich you need your financial software to be, we have best ERP Software Solution like SAP B1 Dubai, Sage 300 Dubai, Sage 50 accounting software UAE HRMS. For more details on these solutions contact us. Is This The Time To Invest In Sage 300?